Bolt Cutter Mounting Kits offer a simple solution to many mounting problems. Posts for bolt cutters fit in the “V” behind the cutting jaw and are ordered for the correct diameter to fit this “V”. Secured by a stainless steel pin and lanyard, the post allows the bolt cutter to be mounted in many positions for easy access and storage. One Bolt Cutter Mounting Kit contains the proper post size, pin/lanyard, and two tool clips for the handles. 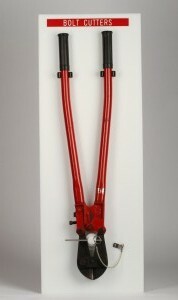 Bolt Cutter Kits mount from the front or rear. Post and Pin mounting kits from Sensible Products offer a simple solution to many mounting problems. As shown below, posts for bolt cutters fit in the “V” behind the cutting jaw and are ordered for the correct diameter to fit this “V”. Secured by a stainless pin and lanyard, the post allows the bolt cutter to be mounted in many positions for easy access and storage. One bolt cutter kit contains the proper post size when ordering and two tool clips for the handles. Order Bolt Cutter Mounting Kits according to the proper diameter of the “V”.